I am a big fan of Kazuaki Kiriya's first feature, "Casshern". Five years after "Casshern", his follow up "Goemon" was released. "Goemon" tells a fictional story of Ishikawa Goemon who is essentially a Japanese Robin Hood. He stole from the emperor and gave to the poor. 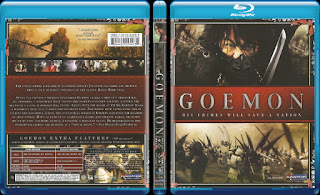 In the film, Goemon is out for revenge in his supposed final days. It is an all out balls to the wall action fest. And Kazuaki delivers with his same stylized visions that he brought to the table with "Casshern". "Goemon", like "Casshern", is shot on green screen backdrops where the breathtaking scenery is added in post. What I love about "Goemon" is that Kazuaki gives us these crazy action sequences that out do all of Zack Snyder's works. It's got more action than "300" or "Sucker Punch". The action seriously doesn't let up until the last minute of the film. It is that crazy. The movie gets a 5/5. I give the video a 5/5, but I have one complaint, you can tell that this was shot on HD and not film like "Casshern". It kinda has that sped up look to it in some scenes, but it's not that bad, as compared to a movie like "Date Night". The colors, oh my God the colors. It's detailed and it's a visual feast for the eyes with all the colorful sceneries that Kazuaki has given us. I watched the film in Japanese first and the 6.1 track is amazing. The English 5.1 audio sounds almost the same, but the dubbing brings it's tone down a notch. Audio is a freakin' beast along with the video. 5/5. The extra's are a "Making Of" which show some in depth comparisons between the final product and the "Animated Storyboards" that were compiled before filming. There's also some trailers for Goemon as well as coming attractions. I fell that this deserves a 5/5 too because we see how Kazuaki's brings the work to life. This is a beautiful release and I feel it is DEMO QUALITY. 5/5 for me. The film looks and sounds amazing. I picked this up for $19 and I am happy to say that Goemon, much like my imported German Blu-ray of Casshern will get lots of replays on my end.